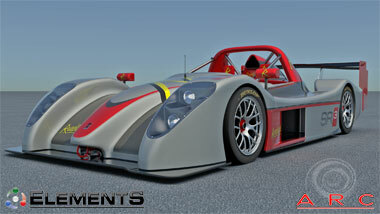 Now available for order at ARC is a more efficient rear wing assembly for the RADICAL SR-3. This rear wing includes a fully shaped 3D wing element and large RWEP with louvers. The design was optimized using CFD Adjoint solver to show the direction and magnitude the wing element needed to be pushed or pulled. Using this data, transient CFD runs were completed and the most efficient shape honed quickly, which was over 5% better than the stock wing and endplates. 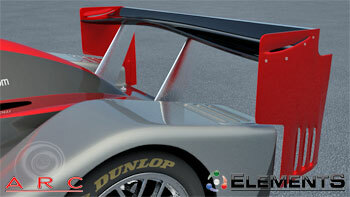 Contact ARC via e-mail or phone at 317-291-8600 to purchase ARC’s Radical SR-3 Rear Wing Assembly for your race car. When collecting surface pressure data, the disturbances on the airflow around the pressure tap must be minimal. ARC has developed an external pressure tap design that is low profile, easy to place and secure on a full-scale vehicle and allows accurate reading of surface pressures. The taps can be purchased in bulk. Contact ARC via e-mail or phone at 317-291-8600 to purchase ARC’s pressure taps for your testing needs. ARC does not compete against its clients with product in the market place. However, when there is a development area that nobody is developing, ARC will sometimes step in and find a solution. For several years, many have looked at commercial vehicle wheels and came up with “add-on” parts with limited success. Some of these attached parts would come off during normal operations. Taking a different approach, ARC decided to examine the entire wheel. After testing several of the wheels on the market and cataloging which wheels caused the least amount of overall vehicle drag, ARC developed an aerodynamic wheel to be the most fuel efficient in the industry. With commercial fuel economy now being an incremental game, ARC wheels measured a 0.75% fuel economy improvement over the best existing wheel and on average gave a 2% fuel economy improvement over the average industry wheels. Contact ARC via e-mail or phone at 317-291-8600.